Highly impactful winter weather is ahead. Most of the area saw 1-3" of snow Saturday evening-night. A few isolated locations just barely exceeded 3". There were a few hours of blowing & drifting in the evening with gusts +25 mph. Snow will overspread the northwest & northern parts of the viewing area later tonight-Monday morning. Temperatures will rise tonight from 4-12 this evening to 26-31 by early tomorrow morning. 0.1-1" of snow is possible in the north & northwest by 6 a.m.
Southeast to south-southwest winds will already be gusting 25-35 mph by Monday morning. Much blowing & drifting of current snowfall will occur area-wide after 4 a.m (just not in the area of falling snow in the northwest & north). A mix of snow, sleet, freezing rain & then some rain is likely viewing area-wide morning to early afternoon as temperatures warm to 32-37 over the area. Winds will be strong from the south to southwest at 25-40 mph. Very minor ice accumulations are possible with additional 1" or less snowfall accumulation to early afternoon. Arctic front will rush in with a "squall line" of heavy snow. It won't last long at all, but it may be a burst of heavy snow with a sudden wind shift to the northwest with gusts 40-50 mph. This may result in brief 1- to 2-minute near white-out in places. This will behave much like a squall line of t'storms. Once this line passes, the temperatures will crash. We should drop from 32-36 to 7-11 in several hours. Flash freeze is likely. Gusts of 35 mph are still likely following the frontal passage with widespread blowing & drifting snow. Arctic front with snow squall line should pass northwest to east/southeast 2-5:30 p.m. over the viewing area. It looks to pass in the general 3-4:30 p.m. time frame over Tippecanoe County. 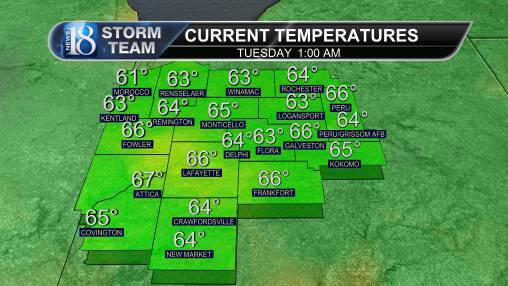 Again, it will be early northwest of Tippecanoe & later east & southeast of there. A quick, sudden 0.5-1" of snow could come down. Snow showers & flurries will follow with an additional 0.5" possible Monday night as temperatures plunge to -2 to 5 by Tuesday morning. Total snowfall should run 1-3" north half of the viewing area(isolated +3" far north) & near 1" for the rest of the area overall by Monday night with very minor ice accumulations. Tuesday may have a few flurries & snow showers early, followed by temperatures falling through the single digits all day. Skies look partly to mostly cloudy. Winds look sustained at 20-25 with gusts to 40 mph. We could be down to -5 to 3 by 6 p.m. over the viewing area & around -11 to -6 by 11 p.m. Winds looks just as strong then! So, wind chills Tuesday will tend to run -25 to -15. By 11 p.m., some areas will see their wind chill drop to -35. Any snow will continue to blow around everywhere & drift about. In fields stripped of their snow cover, topsoil on fields lacking corn & soybean residue (underwent aggressive fall tillage) will begin to blow, staining the nearby drifts of snow brown, black & gray. This dust will blow off deeply-frozen ground. It will be so cold that light, glittery snow should fall with pillars, halos & parhelias (sun dogs) & parhelic circles will be visible around the sun when it comes out behind the hazy stratus/stratocumulus clouds. A light glitter dusting is possible. We should be around -16 to -10 by Wednesday morning with west-northwest winds 20-40 mph. Temperatures may fall some during the day to -20 to -15 by late afternoon. Winds will be just as strong then! Skies look partly cloudy. It will be so cold that light glitter snowfall should fall off & on. Only a very light glitter dusting is expected. Sun pillars, halos, parhelias (sun dogs) & parhelic circles will appear around the sun when it comes out behind the hazy stratus/stratocumulus clouds. Wind chills of -47 to -37 are likely. Wind chills should completely bottom out Wednesday night. With lows of -25 to -17 & west-northwest winds of 10-20 mph, wind chills of -50 to -39 are on the table. The lowest atmospheric thicknesses (480-485 dam) since the extreme 1994 & 1985 cold outbreaks are expected, which means historically-cold actual air temperatures are expected. This means that the troposphere is going to shrink so much over the viewing area due to the density of the cold air. The last time we had wind chills near this cold was January 2014 when wind chills reached -45. You really need to go back to January 1994 to find wind chills to -50 (based on the new wind chill scale). The Blizzard of 1978 saw wind chills drop lower than -50, however. Temperatures were around -20 with winds sustained at 30 mph & gusting 50-55 mph. My thoughts are that our temperature will bottom out at that -25 to -17 level & stay there 12 a.m. to 6 a.m. Thursday. By 7 a.m. Thursday, we should be around -21 to -14 with west wind at 8-15 mph. So wind chills will rise a bit to around -40 to -33. It may be so cold Wednesday night to Thursday morning that glittery snow may fall from a cloudless sky with sun pillars, halos, parhelias & parhelic circles around the sun as the falling ice crystals refract light in vary ways. The last time I remember seeing snow fall from a cloudiness sky was back in 1985. As a 4-year old, the meteorology bug had already bitten me & I watch in utter fascination as glitter fell from a cloudless sky. It was in the morning hours as the sun was coming up in January 1985. We actually had frost like a freezer that formed on the west INSIDE walls of part of my sister's room & our laundry room! I also saw that in December 1989 & January 1994. I was too young to remember the January 1982 cold. 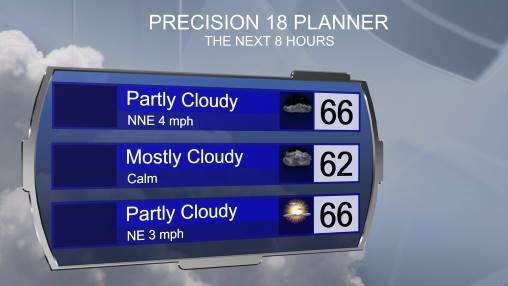 We should only reach -8 to 0 Thursday with sunny skies & a west-southwest wind at 8-13 mph. Wind chills will still run -26 to -15. Thinking that the temperature will slowly rise Thursday night from -8 to 0 to 4-10 by Friday morning as clouds increase. Winds will run from the south-southeast at 5-10 mph. Wind chills should run -10 to -2. It should cloud over with snow later in the day as a clipper moves in. Highs should skyrocket to 16-23 with southerly winds at 10-15 mph. However, wind chills should still run 2-11. Minor snowfall accumulations are possible with this clipper into Friday night.